This is me aged 5 when I wrote my first little book about a naughty fairy who sat at the end of my bed. She was naughty because she would only appear at bedtime when I was supposed to be going to sleep. The book was 5cm high and 3cm wide, written on lined paper and held together with two staples. The fairy felt so real that I was a little bit afraid of her, so I called her 'Madge' to remind myself that she was just part of my i-MADGE-ination. My teachers encouraged us to write about all sorts of things. They showed us photographs and famous paintings and asked us to imagine what could be happening in them. We listened to music and described how it made us feel and the pictures that came into our minds. We wrote about what we did in the holidays which always started off being true, but my stories quickly became mixed up with all sorts of imaginary lands and exotic creatures. As I grew older, I wrote more and more. 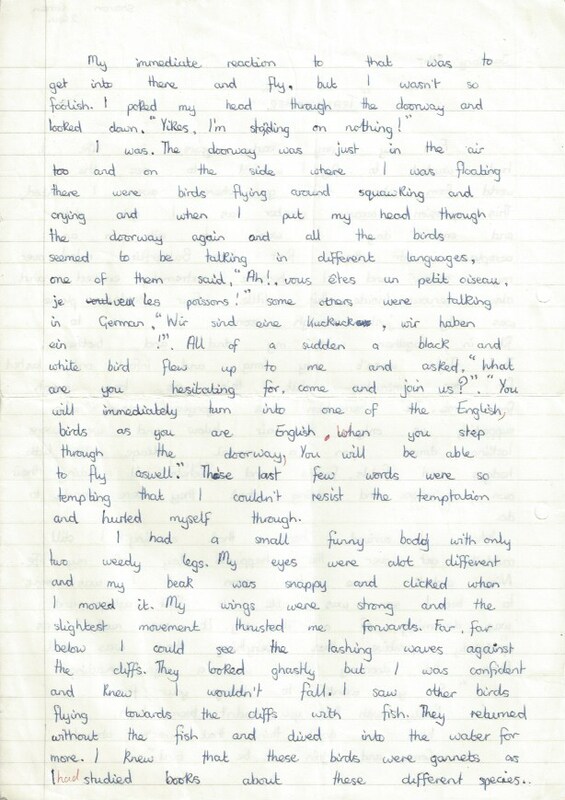 I'm so glad that I kept some of these stories, partly because you can read them now (if you like) and partly because they show how important it is to let your imagination fly and not worry too much about your spelling (sorry teachers!). And here's another called 'Transformed' with the teacher's comments on the last page - Yikes!